BAND-MAID's drummer Akane was injured as the band promoting their new CD, "New Beginning". 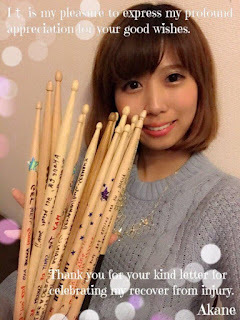 Fans started a campaign which involved sending drumsticks to the drummer, showing their support. "I took a break from drums for 2 months because of the injury. I received many sticks with warm, encouraging messages from my masters overseas! Your words uplifted me and I was able to push through! Thank you so much!" The drummer serves as the leader for BAND-MAID and her absence took an emotional toll on her. Hopefully the drumsticks made her feel well-loved and supported. Akane, you are a great drummer, and I very much hope you and Band-Maid will come to London soon.